If you are new to the UK or new to driving, you may find roundabouts a little confusing and challenging. 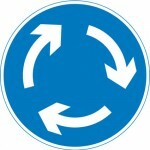 Learner drivers often have a fear of roundabouts due to so much happening at once and often quick reactions are needed. There is a good chance that roundabouts are on the driving test routes for your driving test centre. The driving test often involves taking the most challenging roundabouts in your area. 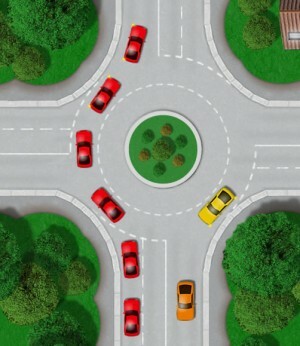 These can be from small mini roundabouts to big multi-lane roundabouts.These tutorials provide both experienced and learner drivers with the correct procedure for taking roundabouts along with tips and safety advice. There are 2 main types of roundabouts. 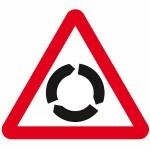 A red triangle warning sign precede roundabouts alerting drivers of their presence. They can consist from a single lane of traffic entering and exiting to multiple lane roundabouts found in high traffic density areas. Approaching traffic must always give-way to traffic already on the roundabout and in the UK, traffic wishing to join a roundabout must give way to traffic already on the roundabout approaching from the right. A learner driver is likely to encounter larger multi-lane roundabouts and mini roundabouts during a driving test if available within the test centre location. Roundabouts are a form of junction and must be approached in a similar way. Whilst driving, look out for any road signs that tell you a roundabout is ahead, or any traffic crossing in front of you that may also indicate a junction is ahead. Locating a roundabout at the earliest opportunity will benefit you on a driving test as it will give you more time to prepare in advance. Similarly to junctions, you can find open and closed roundabouts. A closed roundabout can be very difficult to see traffic approaching from the right due to fences or hedges being in the way and will often require stopping as you reach the junction line. Closed roundabouts are often smaller and found in residential areas. An open roundabout is very clear to see what traffic is on the roundabout as you approach and can reduce the need to stop your vehicle if all is clear. It’s important that the speed that you approach a roundabout is determined by what you see. The less you can see, the slower you go. When you have located a roundabout ahead, during a driving test, the examiner will expect you to use the MSPSL routine. The Mirror, Signal, Position, Speed and Look routine on the approach to a roundabout must be completed every time. 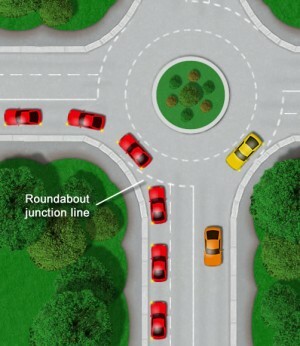 Below explains how to approach roundabouts from each angle. Detailed below is the procedure that the examiner will be looking for when turning, left, straight ahead and turning right at a roundabout. Turning Left at a Roundabout! Roundabout rules must be followed precisely if taking a driving test. The examiner will either give you directions such as ‘at the roundabout, turn left, first exit’, or it may be part of the independent driving. If it is the independent driving part of the driving test, the examiner will not give you directions. Look into your interior mirror, followed by your left wing mirror and signal to the left. Ensure you remain in the left lane for the entirety of the roundabout. Decide if the roundabout is open or closed and slow down to an appropriate speed by covering the brake and the clutch. At around 10-15 meters from the junction line, ensure you are driving at around 10 mph and select 2nd gear. Give way to any traffic coming from the right on the roundabout. If you need to stop, put the clutch down around 3-5 meters before the junction line to avoid coasting. If clear, continue round using 2nd gear in the outside left lane. When you have taken the exit road, ensure you cancel your signal. Straight Ahead at a Roundabout! When approaching a roundabout, it’s tempting for a learner driver to focus their observation to the right as this is where the traffic is coming from. This is problematic as you are not looking where you are going and can lead you to stray into another lane. On approach briskly keep altering observation to the right and in front. Interior mirror needs to be checked initially as you approach. Following the road ahead usually requires use of the left lane although this is determined by road markings or signs on approach. Check if the roundabout is open or closed as this will determine your speed of approach. If you are unsure, slow right down or stop. Stop at the junction line if necessary. Just after the 1st exit, look into the interior mirror, followed by the left wing mirror and signal to the left. Once the roundabout has been exited, ensure you cancel the signal. Turning Right at a Roundabout! Approaching the roundabout will usually require taking the right hand lane. An alternative lane is only required if road markings or signs tell you otherwise. Look into the interior mirror followed by the right wing mirror and signal to the right. Again, always establish is the roundabout is open or closed and use appropriate speed based on what you can or can’t see. If in any doubt, always stop just before the junction line. When clear, continue using the right hand lane until the 2nd exit has just been passed. Then, look into the interior mirror, followed by the left wing mirror and signal to the left. As you are changing lanes to cross into the left lane, before signalling or changing lanes, check the left blind spot. Upon exiting the roundabout, ensure the signal has cancelled. Although many drivers do not indicate or look into the appropriate mirrors, these rules are expected to be followed during a driving test. A relatively common test failure can be forgetting to cancel the indicator once you have exited the roundabout (and not by taking the incorrect exit as many think). Forgetting the indicator can be confusing for other road users. Pedestrian crossings can often be in place just outside of roundabouts. This can cause queuing on the roundabout itself. when approaching a roundabout, try to take a quick look if possible at the exit you will be taking to see if it is clear of traffic. If there is a queue, it will prepare you to establish good lane discipline when joining the queue for the exit road. Locate the roundabout at the earliest as possible to allow time to prepare your self. Always read road signs and road markings as to establish the correct lane to position. What Lane to Use at Roundabouts! This is the general procedure for what lane to use at roundabouts. There are occasions where a different lane is needed and this will be detailed in the form of road markings or signs. 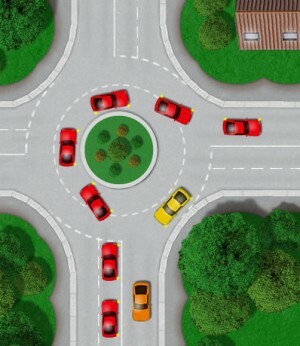 A common driving test failure is to take the wrong lane at a roundabout, panic and take the correct lane abruptly. Taking the wrong lane at a roundabout is not a test failure. It’s the lack of safety and inappropriate action taken to access the correct lane that fails tests. Access the correct lane safely. Use the appropriate mirrors and blind spot and signal before changing lane. Ensure you have enough time to follow this procedure without causing other vehicles to slow down or change direction. If you do not think there is sufficient time or space to change lane safely without following the correct procedure, stay in the incorrect lane. This will likely result in you having to take an alternative route which the examiner will help you with. The test is not about following direction exactly, it’s about driving safely, being courteous to other road users and the ability to remain calm under pressure. Taking the wrong lane will not fail your driving test. Always keep a keen look out for road signs as they help you to prepare for hazards. A roundabout doesn’t always have a sign as you approach although bigger roundabouts will. Whether you are an experienced driver from another country or a learner driver taking driving lessons with parents, it is always a good idea to take lessons with a qualified driving instructor. An established local driving instructor will know the test routes well and will know all the difficult areas where tests are failed. Many of these areas tend to be difficult or complex roundabouts. Ask your instructor where these areas are and take lessons until they are happy with your ability. Extra caution should be taken whilst driving at roundabouts with long vehicles. long vehicles need more room. If a long vehicle is turning right at a roundabout, they may be indicating right but approach the roundabout using the left lane. If a roundabout is relatively small, the long vehicle will need as bigger turning circle as possible and using the left lane on approach will help. If the roundabout isn’t particularly big, it could be appropriate to hold back behind the long vehicle to allow them plenty of room to navigate the roundabout. Roundabouts are safer than junctions and crossroads. Accidents can often occur at a controlled junction when a driver speeds up on the approach so as to make the green light and avoid stopping. This would not happen at a roundabout as it would be too dangerous. Another benefit to roundabouts is that traffic always travels in the same direction, unlike junctions. To an unobservant driver, it will require less observation compared to making a right turn at a crossroads. This also goes a long way into making roundabouts safer than junctions. Mini roundabouts aren’t always put in place as a necessary junction type, but are instead put in place as a form of traffic calming, making traffic slower and roads safer for pedestrians. If there are any big multi-lane roundabouts near to the test centre, there’s a high chance you will be taking it on your driving test. Practice complex multi-lane roundabouts from each and every direction until you are confident about them and exactly which lanes need to be used. Although many other drivers do not indicate correctly, if at all on roundabouts, try to always use the correct procedure for indicating not only during the driving test, but once qualified. Indicating entering and exiting roundabouts makes is safer for other road users as they know what your intentions are. It also makes it easier for other vehicles to progress when wishing to enter the roundabout if you are taking the exit before their exit. Roundabout accidents are often the result of drivers neither checking mirrors or the blind spot when joining or changing lanes. Cyclists are often the ones that come unstuck at roundabouts as they can be difficult to see. Always use mirrors on the approach to roundabouts to check for cyclists or motorbikes and look into the appropriate blind spot before you change lanes (if applicable). Further Tutorials Related To Roundabouts!